Are you looking for something to add to your yard that’s timeless and classic? For centuries, the pergola has been used as a stylish and practical addition to a yard. Pergolas were first used in Mediterranean gardens. They were often placed on lavish estates in order to provide support for grape vines and olive branches. The pergola was considered a sign of luxury. Narrower variations of the pergola were also used to cover cobblestone paths in order to provide shade and to support flowering as well as fruit-bearing vines. 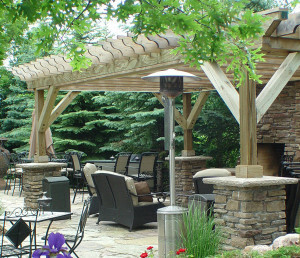 In the modern world of today, pergolas are used for so much more, but they still provide a touch of old-world elegance. You might not have grape vines or olives, but there’s probably a place in your backyard for a pergola. Here we have listed some very innovative ideas and uses for a pergola in your yard. Attaching a pergola to the back of the house so that it can provide cover over a patio is typically what homeowners do. This is due to the fact that it is a practical way to give a little shade, and it also provides a very nice visual addition to the yard. A pergola can also serve to define a space. By adding it to a patio or deck, it creates the appearance of an outdoor room. When the style and color of the pergola are matched or blended in with the overall architecture of your home, you create an addition that not only provides enjoyment but adds value to your home as well. If you have a very large yard and have been thinking about installing an outdoor kitchen with beautiful stone counters as well as that built-in BBQ, then the perfect way to partially protect this area is to cover it with a pergola. The posts for the pergola can be set in stone that can match those beautiful counters, like the pergola over the outdoor kitchen/dining area shown in this photo. The roof line of the pergola can also be tightly laid together in order to create a more effective shelter and provide more shade. Stringing lights between the beams of the pergola can also make this space more inviting in the night as well as making it easier to use after dark. No matter how you plan on using a pergola, it can be a fantastic addition to your yard. Speak with us here at Architectural Landscape Design and we can design a whole new look for your backyard using a pergola as a starting point for the outdoor room of your dreams. We are a licensed MN landscape design and installation contractor serving the entire Minneapolis and St. Paul metro area and outlying communities in Minnesota and western Wisconsin.